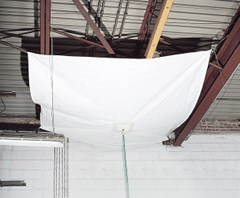 Note: Drain tarps are listed as a cut size - finish size is 3% to 5% smaller. 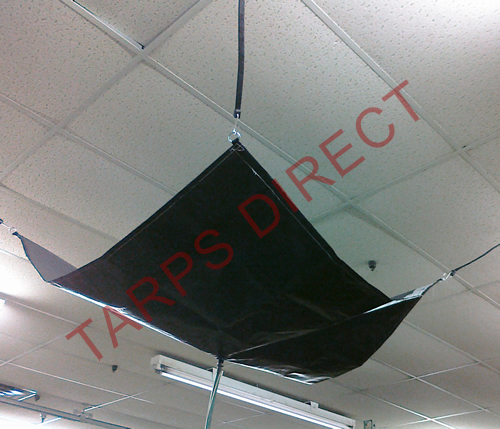 Tarps Direct's Drain tarps offer protection from damage of leaking ceilings, roofs or pipes. Easily installed below the leak source with the help of reinforced grommets (Value series) and heavy duty D-rings (Light and Heavy series) on all corners, water can be diverted through a drain hose (not included) until the issue is resolved. Available in three different weights, select the option that is right for you. Value Drain Tarp Our 5.4 ounce Reinforced Poly (polyethylene) Drain Tarp with reinforced roping in its hems and aluminum grommets approximately every 24 inches allows for easy hanging from ceilings. Reinforced corners provide extra strength and stability. A fitting that allows a standard drain hose (hose not included) to be attached is part of the drain tarp assembly. This allows you to easily divert water until the issue is resolved. This model IS Flame Retardant. Light Transmitting Frosty White in color. Light Duty Drain Tarp 12-Mil Reinforced Poly Drain Tarp with Heavy D-Rings sewn into each corner for hanging from ceiling. Drain spout connects to a standard 3/4 inch garden hose (hose not included). This model is NOT flame retardant. Silver/Black in Color. IN STOCK, Immediate Shipping! 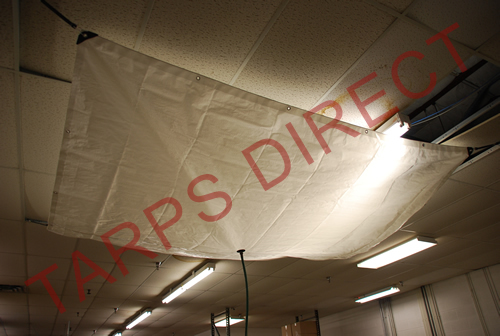 Heavy Duty Drain Tarp 13oz Laminated Polyester Drain Tarp with Heavy D-Rings sewn into each corner for hanging from ceiling. Drain spout connects to a standard 3/4 inch garden hose (hose not included). This model IS FLAME RETARDANT. White in Color. IN STOCK, Immediate Shipping! Tarps Direct's Drain tarps offer protection from damage of leaking ceilings, roofs or pipes. Easily installed below the leak source with the help of heavy duty D-rings on all corners, water can be diverted through a drain hose (not included) until the issue is resolved. Available in two different weights, select the option that is right for you.